What if there was a natural, drug-free alternative to dealing with pain? There is, and you’ve found it. 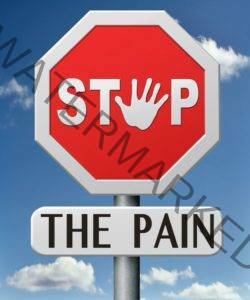 Yep, Hypnosis can work on your pain – all types – WITH A REFERRAL FROM YOUR DOCTOR. What have you got to lose but that old nagging discomfort, agony, torture, torment, suffering, distress, sorrow, grief, heartache, heartbreak, sadness, unhappiness, distress, desolation, misery, wretchedness, and despair. According to the Arthritis Foundation, studies show that more than 75% of people with arthritis and related diseases experience significant pain relief using hypnosis. And the Mayo Clinic reports that Hypnotherapy can also be an effective method for dealing with stress and anxiety. They go on to advise that Hypnosis may be beneficial for pain associated with cancer, irritable bowel syndrome, fibromyalgia, temporomandibular joint problems, dental procedures, and headaches. Hypnosis for pain is not simply about relaxing away the discomfort or making yourself believe that you don’t feel it, it’s about resolving the underlying limiting belief and negative related to it (and often trapped at the site of the pain). There is also a good measure of distraction involved. Because the subconscious mind cannot really focus on more than one emotion or sensation at a time, I can teach you techniques for retraining your subconscious to use triggers to refocus your attention away from pain to positive thoughts, images, feelings and sensations. Your body will follow your mind and pain will diminish, if not resolve all together with conditioning, practice and time. Depending on the nature of the pain, it may take anywhere between 3 to 10 sessions to resolve. Every individual is different so the time and the number of sessions necessary for it to resolve to the client’s satisfaction varies per person. The objective is to give clients tools and empower them to continue to condition themselves to manage pain beyond our sessions together. It is very important to have the support of your medical practitioner prior to moving forward with hypnosis for pain. Florida Law requires that I have a referral from your doctor to work on pain. Getting a referral from your doctor is simple and easy. After all, your doctor wants you to return to optimal functioning too. Simply start the discussion. Here are a few resources from the National Institute of Health to aid you in that discussion. Then, when you are ready, contact me and let’s get your body back to it’s natural thriving state. Click here to read more about how Your Hypnotherapist Can Be A Partner In Your Health & Wellness. Hypnotherapy for the Management of Chronic Pain – The findings indicate that hypnosis interventions consistently produce significant decreases in pain associated with a variety of chronic-pain problems. Also, hypnosis was generally found to be more effective than nonhypnotic interventions such as attention, physical therapy, and education. Neurophysiology of Pain and Hypnosis for Chronic Pain – When hypnosis is used as a treatment for chronic pain, suggestions for change or improvement may target several pain-related outcomes, including decreasing pain, increasing comfort, improving one’s ability to ignore or shift attention away from pain, or changing the sensation of pain to another sensation, such as tingling or numbness. Imagine how life will be when you transform discomfort related to . . .